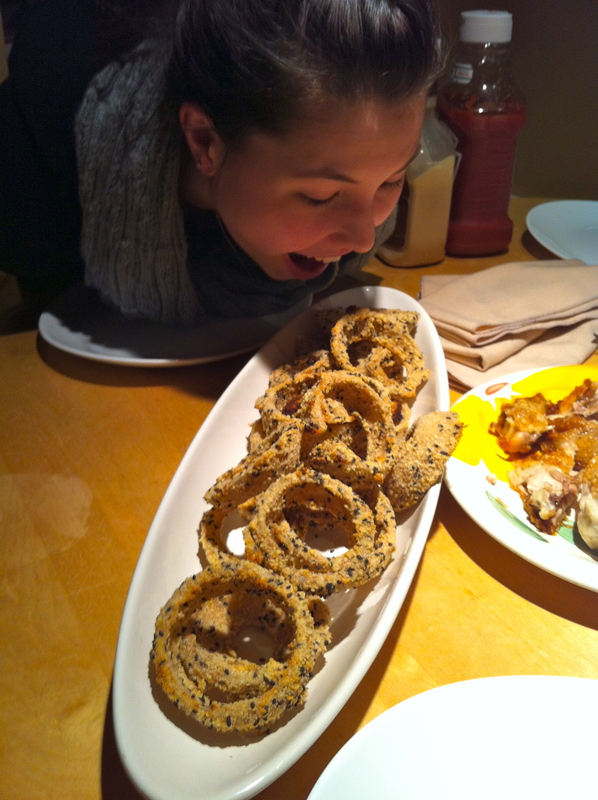 Onion rings and macaroons make for a successful weekend. I’ve had a really nice weekend for once, and I actually got to forgo the mad scrambling to do homework that Sunday usually brings. Today it was more like a quiet fumbling. A nice change. I went to go see the Secret World of Arrietty yesterday. It’s based on The Borrowers, which I read about a million years ago, so I don’t remember the details of the novel all that well – just that I enjoyed it. The movie was really well done though. It’s by Studio Ghibli, so it’s almost guaranteed to be good, and they didn’t let me down. The animation was gorgeous and the story was well told. All in all, I’d definitely recommend it :) I also finished the Hunger Games trilogy. I won’t give anything away, but I was actually kind of disappointed with the ending. It seemed like a bit of a letdown after all that buildup. Nonetheless, it was a good story and a really easy read; I finished the third book in all of two days, and that’s only because I had school and other things to do. There’s a ton of hype about the upcoming movie and I think I might actually see it now that I’ve read the books. I’m always disappointed though when they turn books into movies. There’s just so much more you can do with your imagination that you can’t do on-screen and I’m invariably sad because they missed out one of my favourite scenes or something. But hope springs eternal. Maybe this one will be good. What else do I do when I’m not super stressed out about things? I cook! 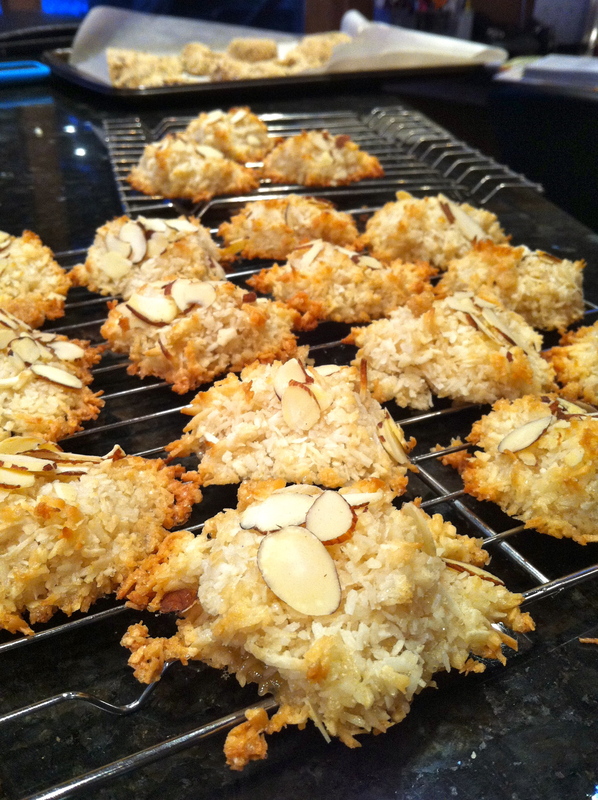 These coconut macaroons are possibly the easiest cookie I’ve ever made. They’re egg whites, coconut, almond essence and sugar. That’s it. And they’re delicious! A bit sticky and quite sweet, so next time I might tone down the sugar a little, but if you love coconut like I do you’ll love these. The recipe is from fitsugar. 3/4 cup Sucanat (or turbinado sugar) – I used raw sugar cubes and smashed them until they were fine. Quite therapeutic. I can’t see why these wouldn’t work with regular sugar though. Separate the egg whites and place them in a bowl. Pour in all the other ingredients into bowl with egg whites and mix them well. Drop spoonfuls onto a greased cookie sheet, about an inch or two apart. If you want to add some almonds, sprinkle them in the middle of each cookie and gently press them in. Bake until light brown, about 12 to 15 minutes. Allow them to cool on the pan for at least five minutes before removing with a spatula (if you try to remove them right out of the oven, they’ll break apart). I made about 18 cookies. Inspired by my cookies, I decided to make dinner too. I made healthy onion rings – yes, it’s possible! Admittedly, they don’t have the grease and glory of their deep-fried cousins, but they also won’t cause clogged arteries and you can eat as many of them as you want. I didn’t mind them at all for a baked onion ring. I also made browned butter balsamic vinegar asparagus, which I think is one of my favourite vegetables ever. They’re so delicious. The recipe for onion rings can be found here. The asparagus, which I started eating before I could take a picture of it, is really easy to make. Simply put your asparagus on a baking pan, drizzle with salt, pepper and olive oil, and stick in the oven at 400 for twelve minutes. While they’re cooking, melt two tablespoons of butter in a saucepan for about three minutes until it starts to turn brown. Remove from heat and add a teaspoon of balsamic vinegar and two teaspoons of soy sauce. Drizzle over the asparagus when they’re out of the oven. Drool and inhale. It’s gonna be a busy week! Good thing I now have macaroons to keep me going.